A massive hoarding with a picture of a gigantic bull and an unarmed youngster who is trying to tame it greets those entering Alanganallur, an agrarian village near Madurai, Tamil Nadu. Here, farmers rear their sons and bulls with equal care, to fight in the annual taming event. The hoarding also thanks the thousands from within and outside the country, who throng the village during the harvest season to witness Jallikattu—the taming event in which rural men use their might to control specially reared and trained bulls. Arguably the largest among such events all over Tamil Nadu, Alanganallur Jallikattu attracts a large number of foreign as well as domestic tourists each year. 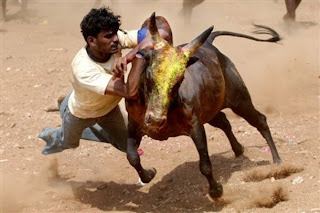 In one respect, it is the Indian version of Spain’s Running of the Bulls, except that no weapon is used and no bull is killed at the end of the game. But the village people are now suspicious of visitors from outside, especially those who wish to meet owners of bulls and the muscular young men who get trained to tame the bulls. They are vigilant against the arrival of animal rights activists, especially those from People for the Ethical Treatment of Animals (Peta) and Animal Welfare Board. The village, which is proud of the centuries-old history of Alanganallur Jallikattu, thinks that even the presence of such activists would deprive them their right to hold the annual event with traditional spirit and valour. Maneka Gandhi is the ‘common enemy’ as most people curse her for putting the event under continuing judicial scrutiny and for terming the valiant sport a cruelty against animals. It was after much persuasion that the village elders us permitted us to visit the families that rear bulls and the boys who fight in the game. At a house near the main Jallikattu venue, an 18-year-old girl was in a dilemma. Though Kavitha was happy about getting admission to the teacher training course at Meenakshi College, Madurai, it was unthinkable for her to take even a temporary break from feeding the Jallikattu bull owned by the family at least three times a day. “The bull is named Raja and he brings fortunes to us. Nobody was able to tame him, though he was participating in Jallikattus for the last four years. It was my duty to give him fodder and water all these years. After all, he is my younger brother,’’ says Kavitha. Her father Kalavasal Selvan started rearing and training bulls from the age of 15. He spends about Rs 225 a day to ensure the well-being of the bull, and this expenditure takes precedence over the daily budget for his family. He buys expensive grains and pulses to feed it. “My daughter was very eager to participate in bull taming events from her childhood. But as per tradition, women are not permitted to take part in the game. So she found satisfaction in feeding and looking after the fighter bull,’’ he says. There are many such women in villages like Tiruvapur, Thammampatti, Ponthukan Patti, Kolamangalam, Pothenpu, Sathrapatty, Achanpatty, Oomanchikulam, Avaniyappur, Puthapally, Nunathalamman Kovil Patti and Palamdedu, where legal strictures fails to take away the spirit of the taming events. The ‘Kangayam’ bull, a local breed, with razor-sharp horns, had provided good economic returns to Selvan till recently, when judicial institutions and the state government issued strict guidelines on conducting the game. 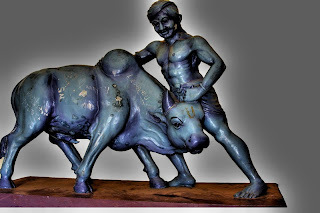 “There were competitions all over Tamil Nadu round the year and the bull was taken to distant places. The net profit per day was a minimum of Rs 1,000. But after the court interventions and enactment of a state law, only six to seven events are taking place in a year,’’ laments Selvan. Alanganallur, which has a population of 19,000 people, has 600 bulls participating in Jallikattu events held in the state. Amarnath, a 28-year-old native of YMR Patti in Dindigul district of western Tamil Nadu, is a Jallikattu expert, who shifted to Palamedu about ten years ago. His urinary tract was badly damaged in a taming event held last year. Over the years, Amarnath has sustained severe injuries to his head, shoulders and abdomen. The price he has paid for the craze to conquer bulls is heavy. But amidst severe pain and continuing treatment, Amarnath happily takes part in Jallikattus, wherever he being invited. “I am a construction worker by profession and the injuries sustained in the game have badly affected my health. But it provides me occasional victories and I am satisfied by them. The chance victories prompt me to ignore the pain and continue taking risks,’’ he says. It is only recently that event organisers have started giving insurance cover to the participating youngsters. Regardless, participants sustain multiple injuries in trying to tame the bull without weapons. Some get killed and many are maimed for life. As many as 14 have been killed and over 120 injured in Jallikattus held across Tamil Nadu during the last eight months. But the risks are not deterring people from trying their luck in the game of valour. “There is a false impression that only poor school dropouts are taking part in the game. Even highly educated men of the region and government employees are taking part in the competitions. It is part of our tradition and no regulation can prevent us from taking part in it,’’ says 26-year-old Arun Raj, who works as a cameraman for a Tamil TV channel. An engineering graduate, he is an active participant in Jallikattus held in the entire Madurai region. Arun had to undergo a major surgery two years ago when one of his kidneys was severely damaged by a bull at Usilampatti village. After one month’s rest, he was active again in taming events. Both his legs were severely injured in May this year in another game held near Thiruchirapally Airport. The doctors advised him three months’ rest. “Since time immemorial, my family has been active in bull-taming events. I wish my children also enter this field. The game needs not only physical strength but also valour and mind power,’’ he says. Sreedhar, 37, has been participating for the last 20 years. Fortunately, he has sustained no major injuries so far. His wife Janaki is happy talking about his achievements. Sreedhar works as a security guard at a mobile phone signal tower. The couple and their two children live in a small two-room accommodation near the tower. Both the rooms are full of prizes Sreedhar’s received by winning the taming games. The prizes include a 24-inch colour TV, music system, LPG stove, gas connection, almirah and wooden furniture. He has also won several gold coins and cash awards. Recently, he was awarded a laptop but the school dropout gifted it to a college student of his locality. He did utilise the air ticket he won at a Jallikattu event, to fly from Madurai to Chennai, though. A man of exceptional energy and determination, Sreedhar wishes to tame bulls till the age of 60, if health permits. Janaki says she feels scared whenever her husband faces charging bulls and attempts to hold their horns. “God has protected him so far. The game is risky but it has provided us all these facilities including TV and LPG connection,’’ she says. The minimum cash prize for winners is now Rs 10,000. At some places in Ramanathapuram, Pudukottai and Thiruchirapally districts, organisers also give 5 to 10 cents (local unit of land measurement) of land to the winners. The demand for best tamers is steadily growing. The bulls, which emerge untamed, too get attractive and expensive gifts. If the bull kills a man, its demand in future events would also increase. Both Arun and Sreedhar say the players have only normal food and simple training. “It is more a game of the mind than of the body,’’ says Sreedhar. “There is no truth in the allegation that it is a cruelty against animals. We use no weapons against them. No animal is being used for any other purpose like ploughing the farm land,’’ claims Arun. “We are just taming them by taking the risk to hold either the horns or tail. You can term the game a cruelty against participating men. But we are taking the risk voluntarily,’’ he adds. He also denies the allegation that organisers apply chilly powder to the eyes of participating bulls and beat them severely to run fast. “The entire Jallikattu is happening in full day light, and that too in the presence of thousands. There is a concerted attempt to blow isolated incidents out of proportion,’’ he alleges. R Vignesh, a Class VI student of Government Boys Higher Secondary School at Alanganallur, is like hundreds of local kids who aspire to tame bulls. His uncle has been training him for the last two years, despite stiff opposition from Vignesh’s mother, who wants to make him a doctor. S Rajasekhar, a 23-year-old Jallikattu player, has received four stitches on the back of his head. Jallikattu and kabaddi are his passions. The injuries are not stopping him from taking further risks. “Have you seen the news item that 260 people were killed in a single plane crash? If you have fear of death, please avoid travelling in buses or car,’’ he says with sarcasm. “These bulls are our children and there is a strong bond between them and their owners,’’ says 64-year-old Alaga Nadar, the oldest bull rearer in Palamedu. “The funeral of a Jallikattu bull is a big event here. Most men in the locality would tonsure heads as a mark of respect to the bull. Rituals using a variety of flowers are held before taking the dead bull to the burial place,’’ he says. 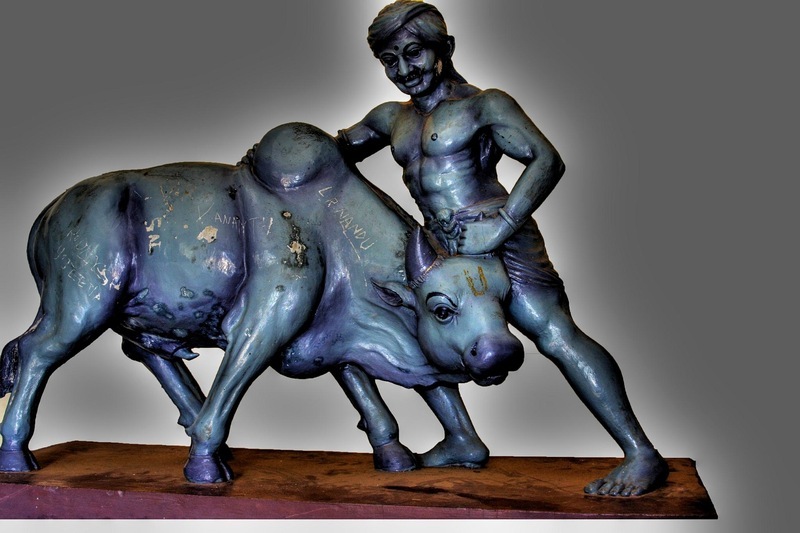 In Vadipatty there is a huge memorial to a legendary bull, which won over a thousand events. At Kottakkudi village near Melur in Madurai, a middle-aged man committed suicide just after his Jallikattu bull died last year, so strong was the relationship between them. Alaga Nadar is now looking after a bull owned by the local temple. 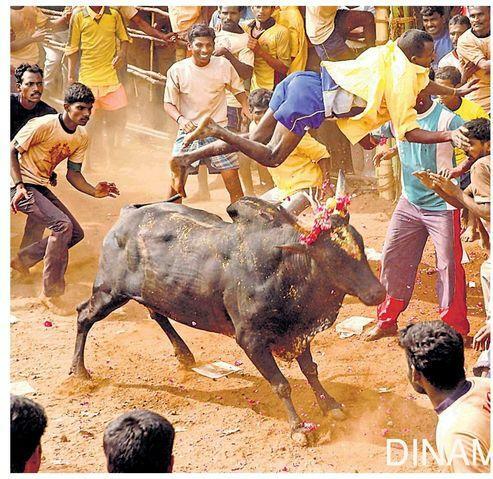 The bull, which represents the village in major Jallikattu events, has seriously injured nine people so far. It would be risky even getting close to it. But Nadar has no complaints about the bull, as it has given his family, among other things, several gold and silver coins, a mixer grinder, TV and an expensive wall clock with a wooden frame. Edakkulam village, like the rest of Malappuram district, is predominantly Muslim with about 60 families of the faith living there. At first sight, the only extraordinary feature here is its vast stretches of wetlands. Look closer into the water and you notice lotuses, hundreds and thousands of them. But even more unusual than this abundance of lotuses is where they finally end up. Since a time villagers can’t even remember, these flowers, tended to by Muslims, have been supplied to every major Hindu temple of note in Kerala like the Guruvayur Sri Krishna Temple, Thrissur Paramekkavu Temple, Kozhikode Tali Temple and Kadampuzha Bhagavathy Temple. Abdurahman and six other rich Muslim families in the village own the wetlands. Young members of the 50 other Muslim families in the locality work as labourers and transport the flowers to the temples. “We supply 10,000 flowers on an average every day to various temples. Now there is greater demand from outside Kerala, especially places like Bangalore,’’ says Muhammad Musthafa, another farmer in the village. The Guruvayur temple alone requires 400 flowers every day. “Temple authorities in and outside Kerala appreciate our work. We have never faced any discrimination from members of other religions,’’ he says. Neither have any hardline Muslim outfits objected to them supplying flowers to Hindu temples. No one really knows when this Muslim village started supplying flowers to Hindu temples. The ancient Navamukunda Temple is nearby and it is speculated that temple priests of yore told Muslims around to start cultivating lotus plants. Nowadays, Abdurahman says, seeing their success, traditional paddy farmers in nearby areas are opting to tend lotus in village ponds. “It is indeed a role model for others to emulate. We are very proud of being part of such a tradition," he adds.